When I looked at this fly, I saw three things wrong—any one of them deserving a fly change. I was fishing with a friend at the January Bonefish School and he made a couple of good presentations that were refused by fish. I asked if I could have a look at his fly and immediately knew why the fish were not impressed. Understand, he was there to learn and asked for my help, I don’t just critique people’s flies for fun. Take a close look at the photo above and see if you spot the three things keeping this fly out of a bonefish’s mouth. 1. First and foremost, the hook is starting to straighten. Proof that the fly had been working at some point. Although this might not keep a fish from eating the fly, it will keep you from landing it if it does. Bending the hook back causes metal fatigue and it will never be as strong. Your next fish might be the biggest of your life. Better to change it. 2. The wing and eyes have twisted on the shank of the hook. This makes the fly ride funny in the water and a bonefish doesn’t need a lot of reasons not to eat a fly. You can twist it back, but once it gets loose it will keep happening. 3. Wrong knot. Boy I’m going to get comments on this one, but I don’t care. There is no reason to ever use a clinch knot on a bonefish fly. I don’t care who told you it was. It’s absolutely crucial that a bonefish fly sink as quickly as possible. A fly tied on with a loop knot will sink twice as fast as one tied with a clinch knot. Don’t take my word for it, try it yourself. I have. Bonefish flies are weighted at the front for a reason: to make them dive head first like the fish’s natural food. When you use a clinch knot, the fly is tight to the line and has to pull the leader down sideways through the water. With a loop knot, the fly can pivot and pull the leader longways through the water. Much less resistance and a more natural action. My buddy changed his fly and caught the next fish he cast to. Remember these three things next time you’re bonefishing and check your fly often. Fishing a fly with issues is just fishing the wrong fly. 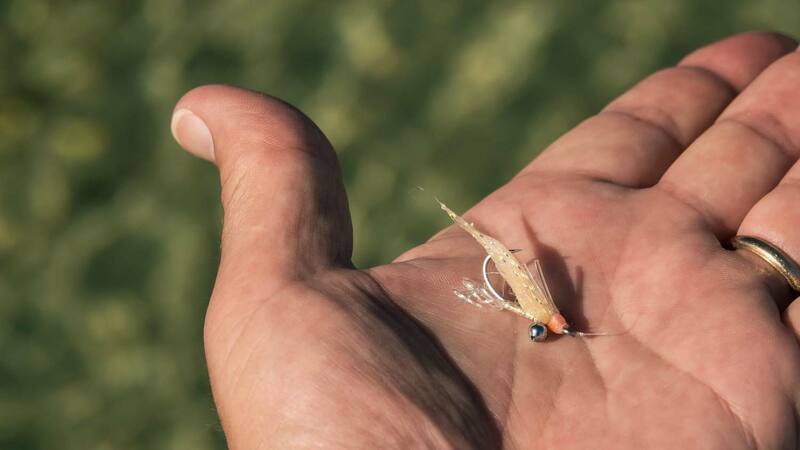 This entry was posted in Fly Fishing Tips & Technique, Saltwater Fly Fishing, The Hot Ticket and tagged bonefish, bonefish flies, Bonefishing, I saw three things wrong—any one of them deserving a fly change., saltwater flies, When I looked at this fly by Louis Cahill. Bookmark the permalink. Good tip on the loop knot. I knew it made a difference but was unaware it made that much difference. Yup, number 3 is pure Rubbish in my opinion…. My guide in Louisiana (Who has won the Sheepshead tournament 3 times) that is made up of saltwater guides only, says that when he fishes Bones, Permit, Sheepshead, he uses a clinch knot and not a loop. He wants instant contact with the fly with any fish that is sensitive to strip speed. He does not want any slack in the line or the knot. He does use a loop knot when fishing streamers for Redfish, Tarpon, because of ‘more action on the fly’. Also, where I fish Bonefish, the water is deep enough and the current is strong that I rarely use bead chain eyes. I use enough Lead that it would sink the entire tippet spool much less the knot. A bead chain eye would be useless. So I agree that sink rate is the most important characteristic of the fly, but the knot is not part of that equation.